What draws man to the desert? Can vast empty plains fill a heart? Are desert flowers hiding in plain sight amongst the emptiness, seen only by nomads crawling toward the next oasis? Join me on a venture through the desert beyond California’s coastline and find out for yourself. Our journey begins near the edge of a large reef in fifteen meters of water. Brittle stars rule the edges of this reef, dominant where fish are scarce. 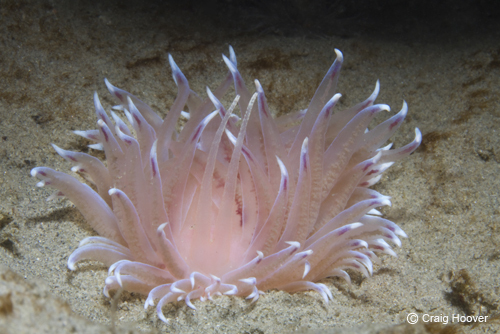 Large tube anemones are also common here, building leathery cases that lead deep into soft sediments. Tentacles wave in the light surge at this depth, ready to instantaneously retreat into the tube if a predator, such as this rainbow dendronotus, grabs hold. The Dendronotus creeps slowly, waiting for the perfect moment. If successful, it will grab a mouthful of tentacles and, in an instant, be pulled halfway into the tube, where it will eat a few of the tentacles, leaving the gnawed bases. A sure sign that a rainbow dendronotus has been feeding in the area is an anemone with amputated tentacles. Dendronotus iris feeding on Pachycerianthus fimbriatus. Surge and current is channeled around reefs, energizing the swells passing by the reef’s edge. Fine grained sand does not settle in places where water is in motion. Often these areas are marked by dunes of large-grained sand mixed with crumbled bits of shell. These dunes may extend for many meters beyond a reef. A savvy nomad can use these dunes to find hidden oases. 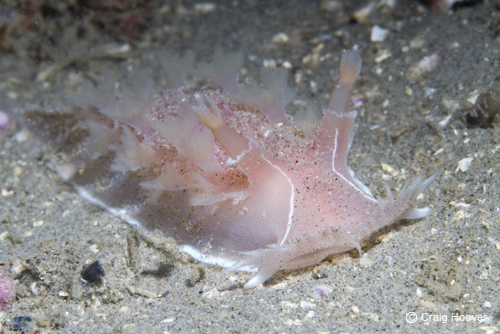 Though flatfish and old shells are found here, the dunes are too unstable to support anemones or hydroids that nudis feed on. The far edges of the dunes are often marked by fine grained sand flats with crumbled little bits of shell. Areas like this may indicate that dunes are nearby. The bottom here is stable enough to allow growth of sedentary invertebrates. Tritonia diomedes is a large cousin of the nudibranchs that may be found in this area, usually near their food source, sea pens. Far from the reef, bits of shell are uncommon. The sand is fine grained and surge overturns much of it. Fortunately, there is prime real estate here. 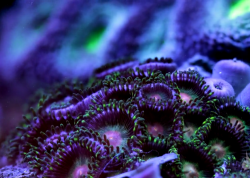 Many hydroids need more stability than bare sand can provide. Worms of various sorts provide the solution by secreting mucus that cements the sand around them into a tube. Drifting bits of algae and blades of seagrass are snagged by worm tubes, forming small clumps. Tiny hydroids are able to settle here and grow into colonies. 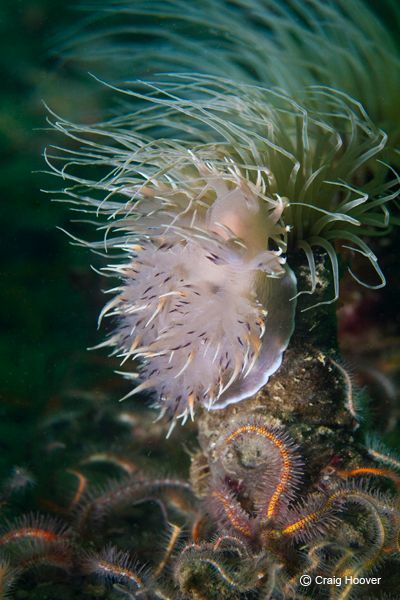 Several aeolids, species of nudis that specialize in feeding on hydroids, take advantage of this food source. Eubranchus rustyus is a tiny aeolid that reaches a centimeter in length but is often much smaller. They are usually located by first observing small white egg masses on their food source, Plumularia. Eubranchus rustyus likes to dine on Plumularia. Another good sign that nudis may be about is the large solitary hydroid, Corymorpha, that may reach ten centimeters in height and can disappear into the sand in a moment. 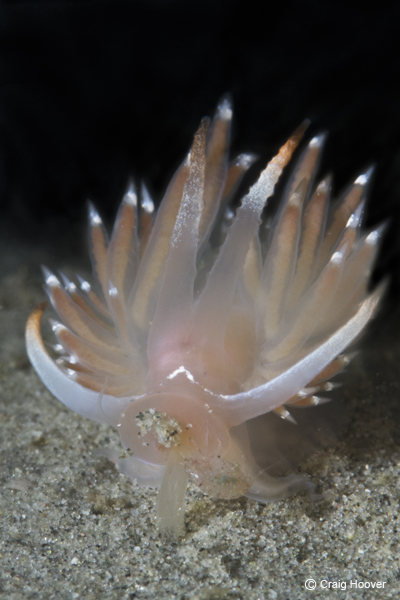 Flabellina cooperi feeds on Corymorpha. Cooperis are quite elusive, perhaps because they are the least common of three species of sand dwelling aeolids that share size and coloration. Cooperis are unique in that they have an upside down white V that sometimes extends back from the forehead along the dorsum. Flabellina cooperi feeding on a small Corymorpha polyp. Hermissendas, in contrast, have a yellow or orange stripe on the forehead. Priceis have no stripe on the forehead. The stripe can be difficult to see in nudis that range in size from one to several centimeters so careful examination of each nudi in this habitat is key to finding the rare ones. 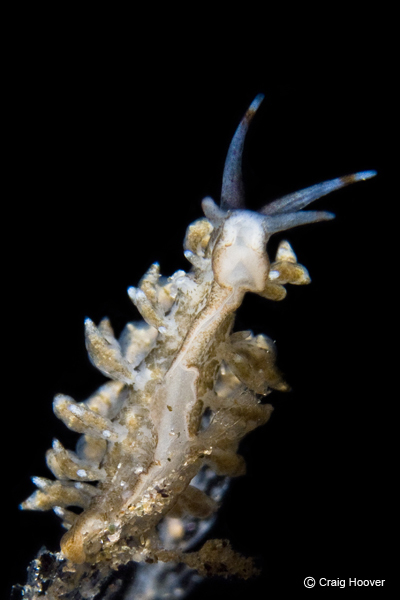 Flabellina pricei is similar to a cooperi. They both feed on Corymorpha, though Priceis are more common. The cylindrical projections on their backs, called cerata, are connected at the base. 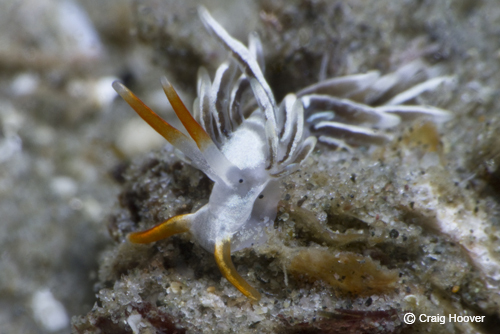 Priceis also have some of the most prominent eyespots of any nudibranch. Looking into the eyes of a pricei is one big step towards filling the emptiness of the desert. Sometimes it is difficult to make heads or tails of a slug. If this is the case, there may actually be two slugs en flagrante delicto. They often finish within a few minutes when carefully observed. Flabellina pricei just after mating. On days when the water is exceptionally calm, the sand may be covered with a thin brown layer of algae. These are really special days in the desert. Nomads who like to create images of the places they have been and the animals they have shared these places with know that swell brings a blizzard to the desert. On days where the sand is covered with a brown layer of algae, the water is usually calm enough to create a good image. Nomads know that flowers bloom in the spring. So do many other things in the desert. It just so happens that animals like to have babies when there are lots of tiny little things for them to eat. 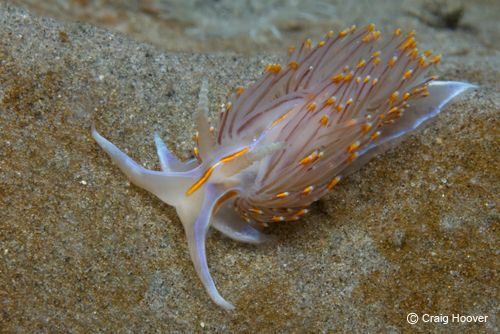 Nudibranchs may congregate to breed during a week or two in the spring and then disappear. Sharing a special event such as a congregation is best done within a week of the initial sighting. Such was the case with Cumanotus fernaldi. Seventy individuals were sighted through the murky spawn of billions of other creatures during the coldest days of April. They vanished a week later. The allure of the desert takes many forms. Some nomads that I know quest for paralichthyid monsters. Others believe the next oasis lies over the dune on the horizon. I found the desert filled with a miniature world, host to a variety of unique desert flowers. The desert is now a destination, filled with the beauty of the little things. Craig Hoover lives in Southern California. He has been diving weekly for the past 8 years, logging over 1000 dives along California's coast. 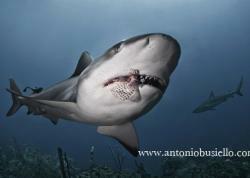 He began taking pictures underwater 4 years ago with the help of the Underwater Photography Guide and its staff. Since then he has taken a special interest in nudibranchs. His goal is to photograph all 100 species that are found in Southern California. 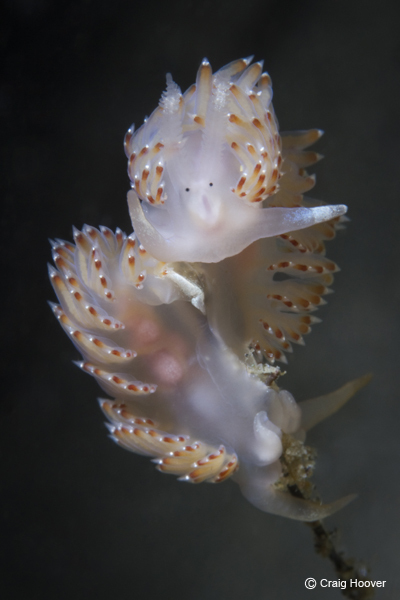 When not photographing nudis, Craig is completing a bacheleor's degree in marine science at California State University Northridge.